For more than 50 years, a key part of the Porsche 911’s appeal has been its pure, focused driving experience, so it’s tempting to look down your nose at one fitted with a turbocharged engine, an automatic gearbox and a folding fabric roof. 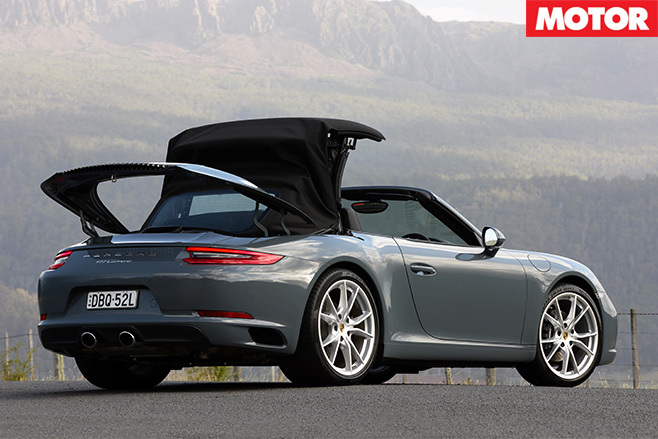 Such preconceptions would be a mistake, however, as while the 911 Carrera S Cabriolet’s image might be more Gold Coast than grand prix, it’s still an incredibly capable and accomplished sports car. 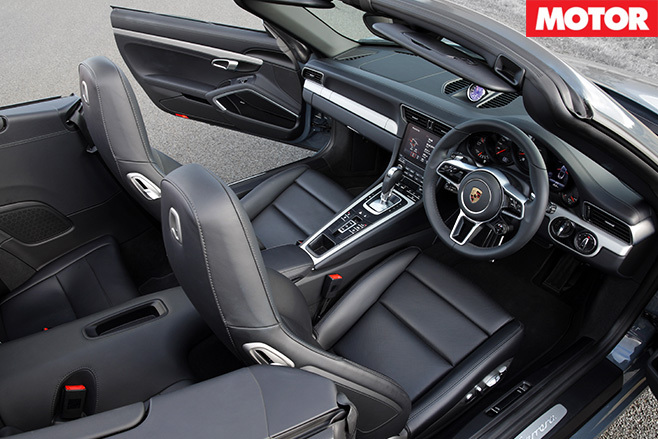 It shares the coupe’s 3.0-litre twin-turbo flat-six, and an extra 70kg isn’t enough to dull the urge of 309kW/500Nm, Porsche claiming 4.1sec for the 0-100km/h sprint when equipped with PDK and Sport Chrono. What’s slightly strange is that while this latest 911 is undoubtedly quick, it doesn’t feel as quick as the numbers suggest as Porsche has gone to great pains to manage the turbo torque in an effort to replicate the feel and response of a naturally-aspirated engine. It’s worked, too, with power continuing to increase all the way to the 7000rpm redline. The linear power curve and impressive throttle response might help hide the new 911’s turbo status, but the soundtrack and the speed with which large numbers appear on the speedo are dead giveaways. The signature flat-six exhaust note is now a bit muffled, but the sci-fi whistle as the turbos spool up – particularly noticeable with the roof down – is some compensation. The seven-speed dual-clutch is a brilliant partner, smooth at low speeds, lightning fast when you’re up it and with a scary sixth sense of knowing which gear to choose when left to its own devices, rendering the paddles almost redundant. Porsche has made the usual dynamic gains with the new 911, but it’s now at such a level – yes, even as a Cabrio – that fully exploiting its full abilities on the road is more or less impossible. If you’re a fan of keeping things neat and tidy then its grip and poise will delight, but if you like to feel a car moving around beneath you then this latest 911 will disappoint. Steering, brakes, traction, body control – every aspect is top notch but it’s so capable that the thrill of driving suffers a little when the car barely feels like it’s trying. 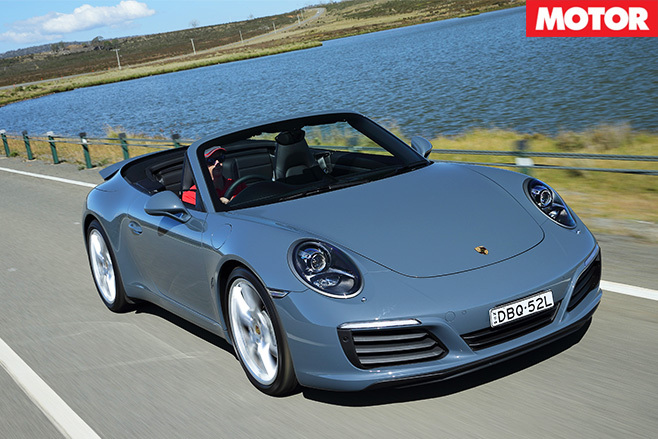 The final question mark regards the 911 Cabrio’s price, which as-tested is an eyebrow-raising $326,080. Granted, not every option box needs ticking, but by the time you add PDK, a sports exhaust and Sport Chrono you’re nudging Porsche GT3 money. Okay, so that’s a different sort of car, but while the new drop-top 911 is a sensationally polished car, its relative lack of theatre is perhaps an opportunity for the likes of the Jaguar F-Type SVR and forthcoming Mercedes-AMG GT Roadster.